At the foot of an extinct volcano just south of Big Sur, California, Frank Zika is playing with molten glass. In his studio, surrounded by a lush garden of avocado and eucalyptus trees, he is exploring the artistic and technical possibilities that have been lying dormant in the expanses of flat glass that surround us every day. To play in this realm Zika designed and built a state of the art, computer controlled, 9000 watt kiln engineered specifically to express his ideas. Since there are very few studio artists in the world forming large panels of architectural glass, all the research and development of materials and methods used to make these works were developed by Zika. This process of discovery is continuous today. The artist's work arise from self-generated innovation and his methodology has been to stretch the parameters of what is known and then force the materials to new uses. His technical methods are as unique as his art. Zika's current work is a synthesis of several artistic disciplines: glass forming, print making, metal working, drawing, painting, and sculpture. A simple design on a single sheet of glass requires over 150 tools and materials being used before it is finished as a framed piece of work. Despite the complexity, the finished work is minimalist in its use of materials, yet powerful in its impact. Complexity yields simplicity. Zika was born and raised by a family of world class artists. In his early twenties he was greatly inspired by his time spent with Tewa potter Maria Martinez from San Ildelfonso Pueblo, New Mexico. During the time he spent with her in the San Jacinto Mountains of California, her simple, yet elegant, burnished black stoneware influenced his use of color. Zika is creating work that reanimates the movement of color in the surrounding environment. The movement seen is not of the sculpture but of the world which it inhabits. Zika's glass is light made solid, pooled on the surface and awaiting the observers eye. The ability to sculpturally manipulate an industrial material and still have it meet all federal safety standards is a rare achievement. It reflects a deep dedication to the material. Because of this, Zika's work can be fully integrated into architecture. 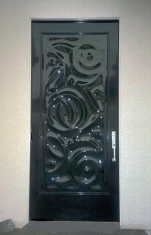 All panels, with some exceptions, can be used as windows and when tempered can be legally and outrageously used as door inserts. 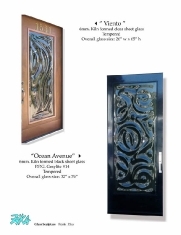 These door panels are not for the aesthetically faint of heart for the entrance becomes entrancing. 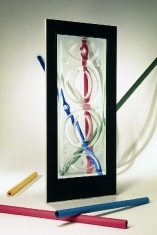 Zika's work has received international recognition being selected among the Corning Museum of Glass' International Selection in 1999 and 1995. 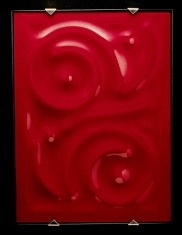 National recognition in having received the 1999 NICHE award for best kiln formed glass in the United States. And regional recognition in being selected for the California Design Exhibition 2002, 1997 and 1994 . 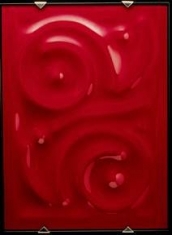 His work has been exhibited in galleries and museum shows with such glass notables as : Steve Correia, John Luebtow, Czeslaw Zuber, and Dan Dailey, Dale Chihuly . Frank Zika is passionate about his work because the work evokes that depth of spirit in the artist. And if the artist is fortunate, the work will similarly open up others to a joy and a wonder.